Say buh-bye to Sriracha. This is the chunky chile oil you’re going to want to put on everything. It gets its signature crisp texture from fried shallots, garlic, and chopped cashews. While this recipe may require a trip to the spice market, we promise you: it’s worth it. The Sichuan peppercorns have that wonderfully numbing, addictive quality that keeps you coming back for more. Porcini powder may seem like an odd addition but it delivers a savory umami undercut. 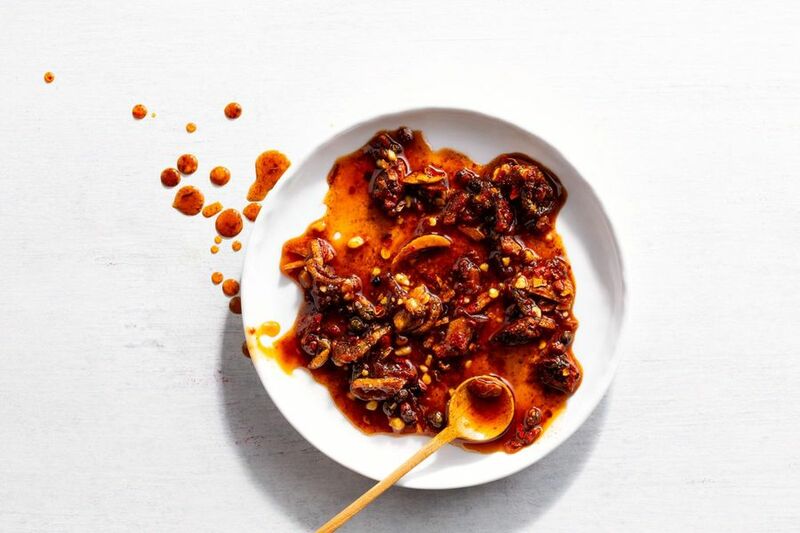 Arbol and Chinese chiles are both quite spicy, while Kashmiri chile powder has a more mild heat, so adjust the amounts to suit your heat tolerance. No matter how spicy you make it, when we say you’re going to want to put this on everything, we really do mean everything—even ice cream. Remove the stems and seeds from the whole chiles. Wash your hands after handling. Grate or peel and finely chop the ginger. Using your hands, break the star anise into small pieces. In a food processor, pulse the chiles, Sichuan peppercorns, cardamom pod, and star anise until coarsely ground. Transfer the chiles to a large heatproof bowl. Stir in the ginger, star anise, cashews, Sichuan peppercorns, porcini powder, sugar, salt, cardamom, Kashmiri chile powder, ground black pepper and cumin. Peel and thinly slice the shallots. Peel and thinly slice enough garlic cloves to measure ⅓ cup. In a medium sauce pot over medium-high heat, heat the oil until it registers 375°F on a deep-fry thermometer. Add the shallots to the hot oil and cook, stirring frequently, until golden brown and crisp, 4 to 5 minutes. Using a slotted spoon or fine-mesh strainer, transfer the shallots to a paper-towel-lined plate to cool. Add the garlic to the hot oil and cook, stirring frequently, until golden brown, 3 to 4 minutes. Keep the oil at 375° F; using slotted spoon or strainer, transfer the garlic to the paper-towel-lined plate to cool with the shallots. Carefully pour the hot oil over the chile mixture. Let cool to room temperature. Coarsely chop the shallots and garlic. Stir the shallots and garlic into the cooled chile oil. Transfer to a glass jar or airtight container. Store in the refrigerator for up to 3 months. Spoon the chile crisp on eggs, meat, seafood, noodles, a favorite vegetable side dish, or ice cream. Chef’s Tip: Handle the hot oil and chiles with care. Pouring the oil over the chiles in the bowl helps prevent scorching. Also, be sure to wash your hands after handling the chiles; for even more protection, you can also consider wearing latex or other gloves. Nutrition per serving: Calories: 90, Protein: 1g (2% DV), Fiber: 1g (4% DV), Total Fat: 9g (14% DV), Monounsaturated Fat: 6g, Polyunsaturated Fat: 2.5g, Saturated Fat: 0.5g (3% DV), Cholesterol: 0mg (0% DV), Sodium: 150mg (6% DV), Carbohydrates: 3g (1% DV), Total Sugars: 1g, Added Sugars: 0g (0% DV). Not a significant source of trans fat. Bonus recipe—ingredients not included in box.